During the late summer of 2016, specifically July and August, several technical analysis systems, as well as Elliott Wave observations suggested that important and at least temporary bottom formation was shaping up in the USD/JPY pair. But it wasn’t until October 2016 that the USD/JPY finally broke out of its trend channel, and retested it (in late October). It then continued upwards as we expected. In November, our initial goal of MA200 was hit, and several systems started showing an overbought signal. While we did expect the move to continue upwards, there were no sideways consolidations visible in the Daily charts which relieved the indicator levels and provided safer entries and natural stop levels for trend followers and late positions. The trend simply powered on strong. It ultimately reached the 119 level in late December 2016, at which point we were almost certain the impulse from October was over or very close to being over. And as you can see, the expected correction in the spliced in December comment, did occur (and might still be underway…). During all this time, and still today, we do not have a reliable Elliott Wave count except for shorter time frames, which forces us to rely on other technical systems, while we wait for the market to clear things up. We use our own proprietary Extended Elliott Wave Theory, in which uncertainty and varying predictability are core pillars of how the system is applied; hence, we do our best to not force wave counts. – Obviously, our analysis caught the bottom formation and subsequent breakout upwards really well. – Our modest price targets of MA200, and then a bit later, the 112-level, were hit. – Overall, our analysis provided several very safe entry points for those wishing to go long the USD/JPY. – We did warn about the top at 118 and the subsequent correction, however, we’re not taking too much credit for that, because we expected several smaller corrections along the way in the uptrend, and they didn’t start to show up until late November. – Obviously, the trend was far stronger than we anticipated, and left very little room for pullback buyers and it made risk management hard (depending on system and preferred entry methodology), due to there being very few natural stoploss levels along the uptrend, forcing one to resort to either staying out, or jumping in with a gliding stoploss (not necessarily a bad idea, but it has its drawbacks). It’s important to find a good entry, because it will simplify risk management once a big move gets underway. Trends usually go on for longer than most participants expect; hence the old adage “Let the trend be your friend.”. If you are uncertain about the longevity of a trend, but have a good entry position, you can scale down your position, and let an amount of your original position that you are comfortable with still run along. And, if you are late (which of course is not ascertainable at the time of entry…) to a trend, be aware that yes, it can continue for longer, but your risk management needs to be different compared to if you have a solid low-risk entry position. We are more or less forced to be prudent and warn over oversold conditions when we see them, and in this case, apparently the USD/JPY had a lot of power and way to go from where the first such readings started to appear. All in all, this was a series of profitable and potentially very profitable calls we made on the USD/JPY. They weren’t perfect, but market calls and executed trades rarely are. Lastly, please note that the attached chart is a very simplified chart compared to what you get as a subscriber to our services. 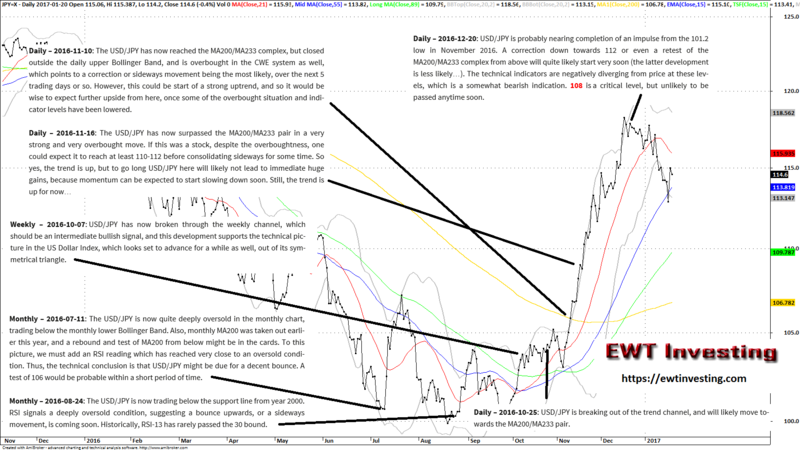 We present our analysis on any given stock market, commodity or FX pair, with 4 detailed charts with more indicators on Monthly, Weekly and Daily (2x) time frames, and we provide our assessments of the trend, risk/reward situation, as well as written comments of the type we have spliced into the chart used for this write-up. Thank you for your interest and we wish you relaxed and safe trading.